European researchers have built circuit logic units using living slime molds; this could be the start of computing devices and sensors. Andrew Adamatzky (University of the West of England, Bristol, UK) and Theresa Schubert (Bauhaus-University Weimar, Germany) have used networks of living, interconnected slime mold tubes to process information. In earlier work, the team demonstrated that such a tube network could absorb and transport different colored dyes. They then fed it edible nutrients -- oat flakes -- to attract tube growth and common salt to repel them, so that they could grow a network with a particular structure. They then demonstrated how this system could mix two dyes to make a third color as an "output." Using the dyes with magnetic nanoparticles and tiny fluorescent beads, allowed them to use the slime mold network as a biological "lab-on-a-chip" device. This represents a new way to build microfluidic devices for processing environmental or medical samples on the very small scale for testing and diagnostics, the work suggests. The extension to a much larger network of slime mold tubes could process nanoparticles and carry out sophisticated Boolean logic operations of the kind used by computer circuitry. The team has so far demonstrated that a slime mold network can carry out XOR or NOR Boolean operations. Chaining together arrays of such logic gates might allow a slime mold computer to carry out binary operations for computation. 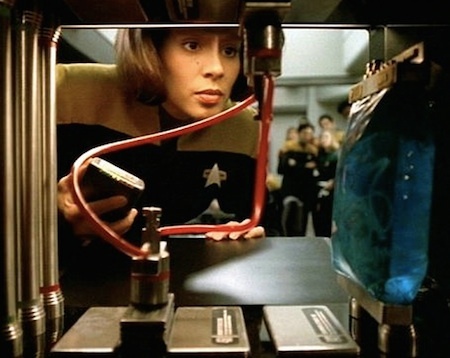 Fans of Star Trek Voyager may recall similar technology described in the 1995 episode Caretaker. The gel packs formed the basis of the bio-neural circuitry, which was essentially an organic computer system. The packs contained neural fibers surrounded in a blue gel with metallic interfaces on the top and bottom. They helped store more information and operated at faster speeds than isolinear circuitry. The fibers in an individual gel pack were capable of making billions of connections, thus generating an incredibly sophisticated and responsive computing architecture. This kind of organic circuitry allowed computers to "think" in very similar ways to living organisms; by using "fuzzy logic", they could effectively operate by making a "best guess" answer to complex questions rather than working through all possible calculations. This was due in part to the inherent ability of organic neural systems to correlate chaotic patterns that eluded the capacities of conventional hardware. Via ScienceDaily; thanks to an anonymous reader for the tip and reference on this story.